1 LIGHT IT UP: Brighten your holiday season with lights as they are switched on for the first time Friday night at Dale Ryan and Dyanah Musgrave’s Christmas house at 1525 Fifth St. and the city’s official Christmas tree in Frank Crowe Park, 537 Nevada Way. Lights at the house on Fifth Street will be turned on at 5 p.m. and Jingle Cat, Santa and Mrs. Claus will preside over the festivities at the park at 6 p.m.
Dale Ryan and Dyanah Musgrave's home at 1525 Fifth St. will be lit for the season at 5 p.m. Friday, Nov. 30. 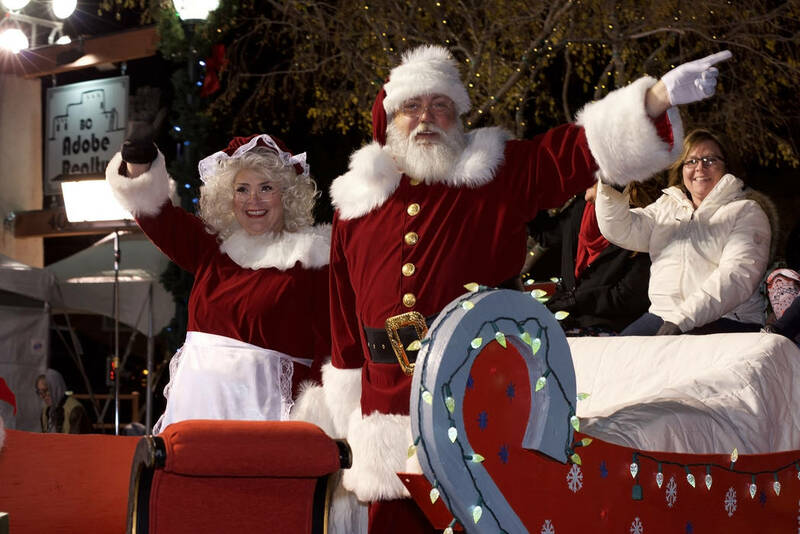 Santa and Mrs. Claus provide a traditional end to Santa's Electric Night Parade, which begins at 4:30 p.m. Saturday, Dec. 1. 2 LET ’EM BUG YOU: Boulder City Community Club will present its 44th annual Doodlebug Bazaar from 9 a.m. to 4 p.m. Saturday at the city’s recreation center, 900 Arizona St. More than 130 vendors will showcase handcrafted wares and gift items. From 11 a.m. to 2 p.m. Boulder City Chamber of Commerce will host Santa’s Picture Party inside the old gym offering a chance to have your or your loved one’s photo taken with Santa Claus. 3 ENJOY THE PARADES: Bands, floats, equestrians and cars decorated for the holiday season will travel the streets in the historic downtown area of Boulder City on Saturday for the annual Santa’s Electric Night Parade. The parade begins at 4:30 p.m. on Nevada Way near Wilbur Square Park and ends on Fifth Street. For more parade fun, go to Lake Mead Marina and Las Vegas Boat Harbor for the 42nd annual Christmas Parade of Lights on Lake Mead. The parade departs from the marina at 6:30 p.m.; awards will be presented at the marina at 8:30.